IPP First Responders are trained IPP volunteers who are willing to be on-call should a new infestation be identified anywhere in the State of Maine. This mobile, ready-to-go team is able to move confidently and swiftly when the need arises. With the Lake Stewards of Maine (LSM) coordinating with the local lake community, trained Plant Patrollers may be paired up with members of the local community who may have great familiarity with the lake of concern, but limited knowledge of invasive plants, thus enhancing not only the quality of the survey, but the quality of the survey experience for everyone involved. The First Responder concept was successfully tested on Damariscotta Lake in 2009 when twenty-seven trained invasive plant patrollers (many traveling from distant corners of the state) participated in the intense search that followed the discovery of hydrilla in a small cove along the western shore of Damariscotta Lake. To date, no additional hydrilla has been detected in the lake. Over the 2011 Fourth-of-July weekend, LSM “Invasive Plant Patrol First Responders” scoured the entire shoreline and shallows of Tripp Lake in Poland, looking carefully, methodically, with trained eyes, for something they hoped they would not find. On June 14th, 2011 a Courtesy Boat Inspector (CBI) on Kezar Lake in Lovell removed a plant fragment from a boat preparing to launch. This small, rather bedraggled specimen turned out to be Eurasian water-milfoil, one of Maine’s eleven most-unwanted invasive aquatic plants. According to the records of the CBI in Lovell, the boat that carried the Eurasian water-milfoil had last been in Tripp Lake in Poland. Tripp Lake is not currently known to be infested with any aquatic invader. The situation begged a host of questions. What was Eurasian milfoil doing in Tripp Lake? Was it quietly gaining ground there in some back cove, as yet unnoticed? Could the Eurasian milfoil fragment have been deposited in the area of the public boat landing by yet another boat, one that had just recently come from an infested lake? Lacking the full registration identification number needed to find the Kezar Lake boater, and information that might help trace the plant’s origin, there was only one course of action to be taken: all of the shallow areas in Tripp Lake capable of supporting rooted plants had to be immediately screened, in order to rule out the presence of Eurasian water-milfoil. The LSM put out an urgent call to its Invasive Plant Patrol First Responders, a team of highly trained and experienced volunteer lake monitors that have signed up for special duty: responding to newly identified (or suspected) infestations by conducting a comprehensive invasive aquatic plant survey on the waterbody of concern, as rapidly as possible. When it comes to effectively controlling invasive aquatic plants, early detection and rapid response are critical. The team moved rapidly indeed! Within two weeks, the IPP First Responder’s Level 3 survey on Tripp Lake was complete. The findings were conclusive: no Eurasian water-milfoil was detected, nor was any of the other invasive aquatic plants on Maine’s prohibited list. (The team screened for all eleven, and conducted a native plant inventory to boot!) A small population of Chinese mystery snails was observed in area of the public boat landing, possibly a relatively new introduction to Tripp Lake. One small floating fragment of milfoil was spotted, collected, and sent to a lab for DNA species confirmation. 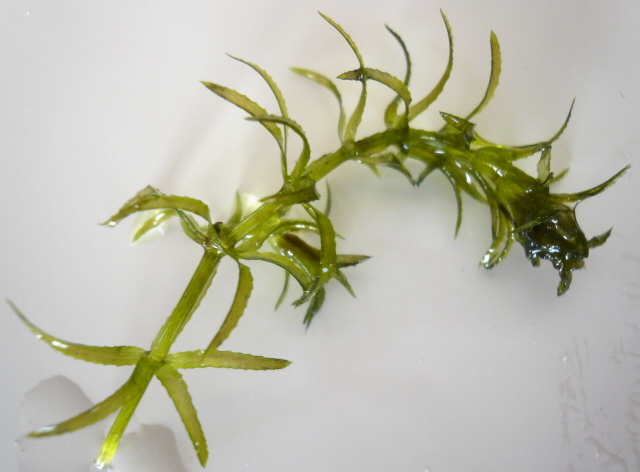 The specimen proved to be a native milfoil species. With the help of the Tripp Lake Improvement Association, the volunteer monitoring effort on Tripp Lake will continue. Plans are now underway to form a locally sustainable IPP team on Tripp Lake. Many capable hands (and eyes!) came together during this incident; some working behind the scenes, others on the front lines. Each acted swiftly, skillfully, and cohesively—playing their role in Maine’s ever growing, largely volunteer-powered system; working together to protect Maine’s lakes, ponds, rivers and streams from the treat of invasive aquatic species.